Pension Sabaria is located in Hegyhátszentjakab, on the banks of the Vadása Lake. The village is situated in the Vas ridge, 20 km south of Körmend and 7 km west of Zalalövő. The village has belonged to the Őrség National Park since 2002. In addition to local dishes, our restaurant offers a wide range of roasts from Mid-June to the end of August. We provide catering for groups from May until the end of September. 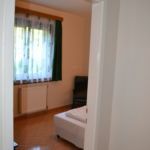 The accommodation can be booked with breakfast or half-pension. The two lakes situated in a picturesque setting provide an excellent opportunity for tourists wishing to relax, bathe or fish. The area is perfect for excursions, hiking and bicycle tours. Several angling, horseback riding and bathing opportunities are available within a 20-km radius. There are a pool, a common room, a playground and an open-air fireplace at the pension. Games: board games, table tennis, badminton and bicycle rental. The rating of Sabária Vadása Panzió Hegyhátszentjakab is 9.4 from the maximum 10, 83 based on actual and valid guest ratings and reviews. "A szobák között nagy az áthallás"
"Rendkívül kedves személyzet, gyors kiszolgálás." "Kellemes időt töltöttünk itt, gyönyörű környezetben." Based on the reviews and comments of actual guests, the services of the Sabária Vadása Panzió Hegyhátszentjakab have received a high rating of 9.5/10.